The Coronado Playhouse on Strand Way is like ‘The Little Engine That Could’. 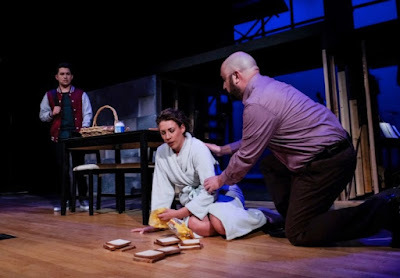 After coming off their successful run of “King Charles III” they are knee deep in mounting a fantastic, no incredible “ Next To Normal” with book and lyrics by Brian Yorkey, and music by Tom Kitt through June 17th. Run don’t walk to see how smallish doesn’t impede striving for excellence. 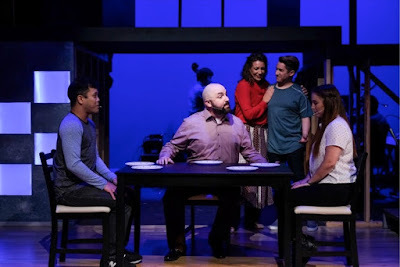 Director Chad Oakley, making his Playhouse directorial debut, with versitile and competent cast and crew have done wonders with the staging of what happens to be my all time Tony Award winning show. 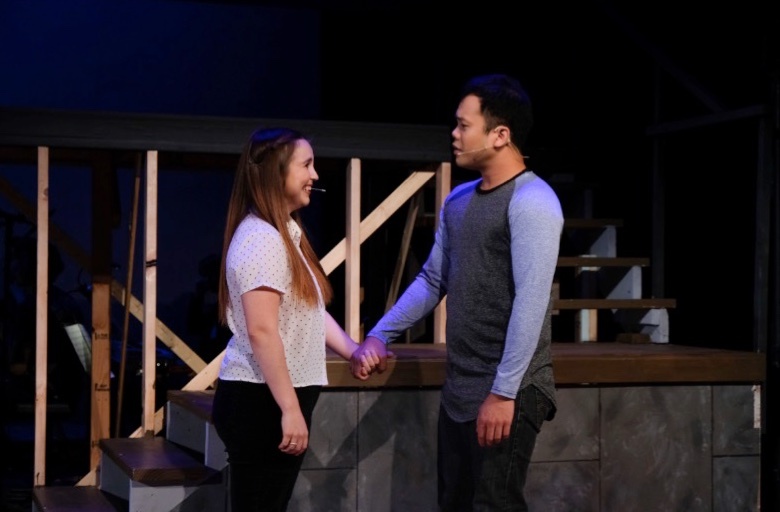 “Next To Normal” opened on Broadway in 2009 and was nominated for eleven 2009 Tony Awards and won three, Best Score, Best Orchestration and Best Actress in a Musical for Ms. Ripley. Just for the frosting on the cake it also won the 2010 Pulitzer Prize for Drama. Someone must be paying attention. Family illness is at the core of this heartwarming, touching yet gut wrenching and brilliant musical, bordering on operatic (it’s considered a rock opera) proportions. With and relatively unknown (to me), soprano Rebekah Rawhouser and Anthony Don Donovan (another unknown) in the leads this proud production pulses energy throughout. The story centers on Diana Goodman (Rawhouser). At the heart of the Goodman family, the glue that holds it together for better or worse is her husband Dan (Donovan). While confronting his own depression and confusion, his monumental task is maintaining some ‘normalcy’ in his family. For eighteen years the Goodman family has been struggling to cope with Diana’s bipolar disease, anxiety and the trickle down effects of a series of mental disabilities. Much to the detriment of their daughter Natalie (another unknown to me Chloe Marcotte) and son Gabe, (SeeJay Lewis last seen in OnStage “Spring Awakening”) the family dynamics, like the half completed walls in their home (Jacob Sampson), are open for all to see the unfinished-ness of the family. The clues are everywhere. Donovan’s Dan, who has the patience of a saint, holds on desperately to what he thought he had and what he wants (“It’s Gonna Be Good”, “Better Than Before”). His performance is vivid, painful and heartbreaking as the struggles, barely to keep it all together unerringly one breakdown at a time. His words and emotions come effortlessly but not without question as he makes his way through the maze of his wife’s illness. His, he relates after cleaning up from Diana’s attempt into the abyss, is just a slower suicide. (“A Light in the Dark”). 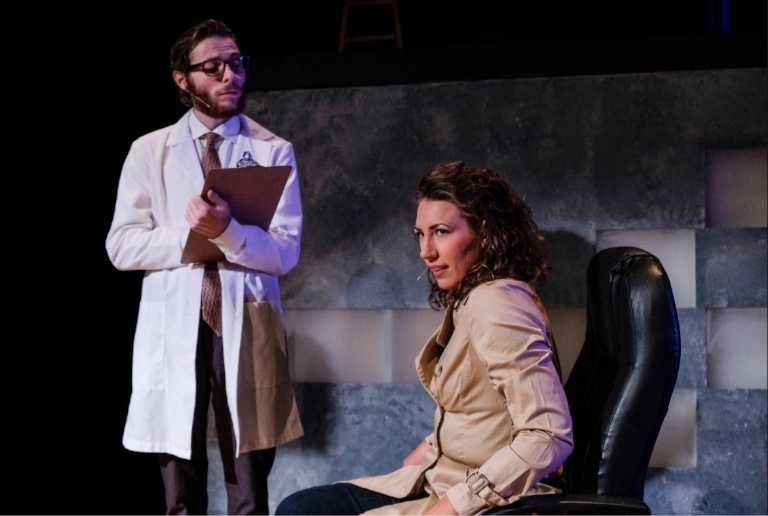 Connor Boyd plays Diana’s psychiatrists (“Whose Crazy?”) as they keep her drugged most of the time so she can barely function. His performance in one scene shows a psychedelic dance that is pretty funny but all too true of what she must feel like after she takes all those pills. Boyd is low keyed and effective as the Drs. treating Diana. 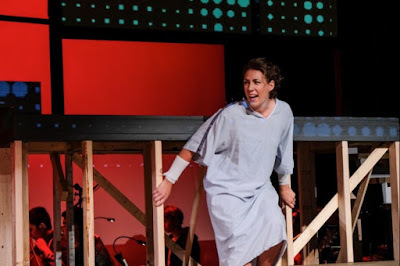 Whatever you might have heard about the musical, you have to see and hear for yourself Rawhouser’s performance. Her voice is haunting and her portrayal of Diana is heartbreaking, somewhat like an open wound that won’t heal. Her interpretation of “I Miss The Mountains, I Miss The Pain”, where she recognizes that ‘everything is perfect, nothing is real”…and she misses her life, just about sums up her tortured and drug laden mind. It gives us insight to her agony. On the outside, she goes through the motions but just beneath the surface there is a ticking time bomb ready to explode at any moment, and sometimes does. No one dies of an incurable illness in “Next To Normal”. The sickness that’s paralyzing this suburban family is a silent killer because it destroys little by little with red, green and white, chewable and swallow whole pill at a time. (“Whose Crazy/My Psycho pharmacologist”). The pièce de rèsistance is SeeJay Lewis’ Gabe, brother and teenaged son who holds the key to his families’ secrets and messed up lives (“I’m Alive”). Burning the candle at both ends, Gabe is the panacea to all Diana sees as good on the one hand and the caveat to all that is destroying the family and blocking Diana from reality on the other. Lewis is alluring and irresistible showing a deep and mature understanding of his role as son and brother. His physical attributes, good looks and nimbleness give him the tools to tool around set designer Sampson’s multi tiered house in the burbs that has a few staircases and platforms holding it together. Fortunately for us director Chad Oakley was astute enough to gather a dream team for this absolutely magnetic musical that is no easy fete. 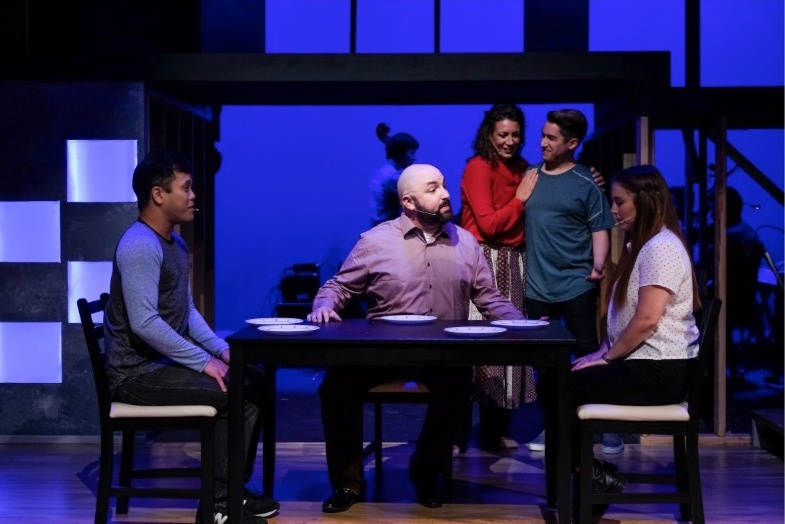 Cast of "Next To Normal"
Musical director Martin Martiarena and his full sounding six-member band come together hand in glove with the outstanding voices on stage. Once in a while some modulation and less volume from the band would have been helpful in hearing some of the lyrics. 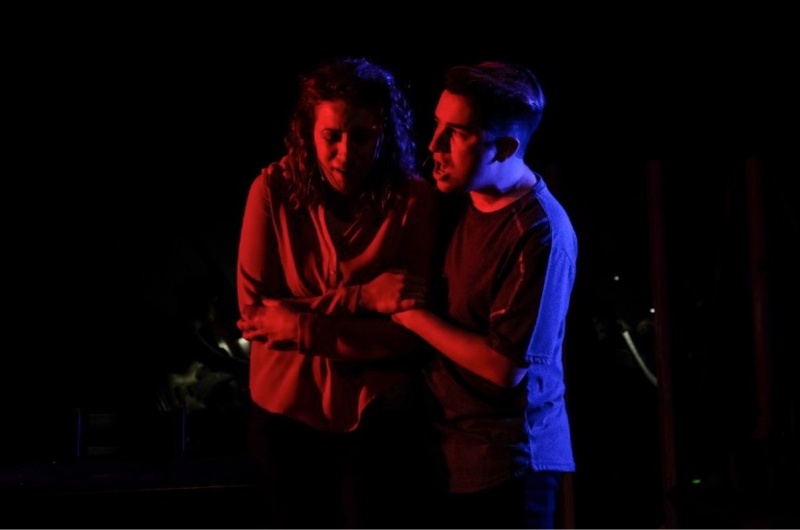 Sarah Robinson designed the appropriate costumes and Josh Olmestead designed the lighting with Anthony Zelig projections, bringing light, darkness and visual images into this somber look at the underside of mental illness yet always wishing for a ray of hope at the end of the tunnel. Staging a musical about mental illness might not be for everyone, but I would recommend it highly. Pulling the covers over our heads is not an option for helping someone in need. And for a recommendation: Two thumbs up!